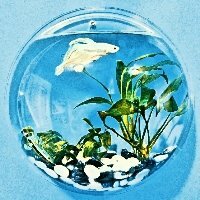 I had posted a topic on 8-4 that said, A big gorgeous Oranda and I have been thinking about that fish ever since. So today I got in my car and drove a couple towns away from where I live to go see this fish again. I had asked some more questions today. Two different employee's told me the fish has only been in Petsmart since the end of June, first week of July. (not 6 months like the other girl told me on the 4th) These two employee's also told me this fish did not kill two other Oranda's. Anyway, after talking for several minutes to these two girls I then asked if they could take the fish out so I can see her/him up close in a breeder box. The fish was in a high display tank and so harder to see. When I saw the fish I was ecstatic. The Oranda was not a Chocolate like I first thought. He/She is a beautiful big Blue Oranda. Correct me if I am wrong but the fish is Grey which means a Blue Oranda. He/She looks very healthy. Has a big wen on top of the head coming down on the full cheeks. His tail is kinked a bit but oh my gosh the wen and face totally makes up for this little flaw. I had to purchase this fish. I thought I hit the lottery at Petsmart. to find such a beauty here. I came home with the fish and set up the 10g qt w/airstone. (if you think it would be best to put the fish in the 20g long I will because I have one) I'm going to start the fish on prazi sometime tomorrow. The fish was friendly enough for me to do a quick measurement. He/She is about 4 inches in body alone and 6 1/2 inches total. I gave him a few Hikari pellets but 10 min. later the food was still at the bottom of the tank. So I took it out. Okay, Here are the photo's of my new Blue Oranda. Thank you so much for checking out my newest fish. Beautiful oranda! I can never find anything like that a petsmart! Lucky duck. Congrats with him/her and i hope for a fantastic qt! Love it! (S)he looks like a happy chubby baby in the last one. I can totally see why you couldn't get it out of your head! Absolutely gorgeous!
. Gorgeous blue Oranda!!!!! Good luck with him!! Thank you so much. I feel like I hit the fish lottery. Thank you so much. I am so happy with this big guy/gal. Thank you so much. I am loving the grey chubby face. And the wen goes down the side. Thank you so much. I wasn't planning on getting another one. I will now have 4 in my 55g. after qt. It will and can work for me because I do huge every 5 days wc's. Thank you so much. Yes, I kept thinking about this fish. I kept going back and fourth asking myself questions if I should or shouldn't. Thank you so much. I hit the jack pot at Petsmart on this big fish. Thank you so much. So it's agreed a blue oranda? I might put the fish in the 20g on Sat. Still kind of thinking about that. It will be easier on me to leave the fish in the 10g but don't want to cramp the big fishy. But really, I don't want to make the fish feel cramped and harm his/her growth during these several weeks of prazi. I spy breeding stars on his pecs, looks like a boy to me! Edited August 8, 2013 by Daniel E.
He's definitely one of those must-have fish. Congratulations on an amazing find!! Aww what a sweet little face, I wouldn't be able to say no to that either!